PALEO JAY SMOOTHIE CAFE: PaleoJay’s Smoothie Cafe podcast #64- How to get Really Fat! AND-You really can’t resist- Resistant Starch! PaleoJay’s Smoothie Cafe podcast #64- How to get Really Fat! 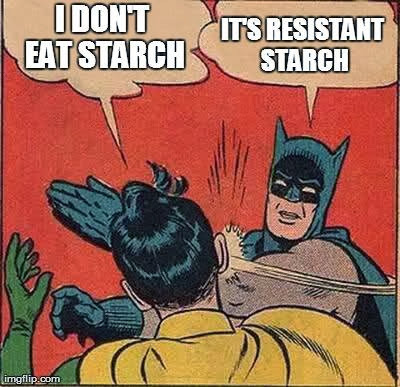 AND-You really can’t resist- Resistant Starch! How to get Really Fat! You really can’t resist- Resistant Starch! oJay has the answer! I can tell you exactly how to get real fat in record time, easily and quickly! First off- count your calories! They are all that matter, after all, right? So, count your calories closely, so you can start to consciously limit them. Because, if you limit your calories to less than your body wants, you’ll lose weight, correct? Some of that weight, perhaps even most of it will be muscle and bone, but hey- the weight is all that matters- the scale. Next, limit your fat intake! Fat has more calories per ounce than any other nutrient source, so you must try to eliminate fat from your diet! Eat lots of healthy, whole grain products- processed cereals, low fat processed foods of all types, and lots of industrial seed vegetable oils. Don’t even think about butter or bacon or, God forbid, coconut oil! High fat all! Exercise for long, long periods of time, extremely slowly and preferably on a metered cardio machine that counts exactly how many calories you burn each session. ! hour per day is good; 2,3, or 4 hours daily is even better! Move more and eat less, right? Ignore food quality! A calorie is a calorie is a calorie! And so, you are better off eating a 100 calorie snack pack of cookies, rather than that avocado with over 300 calories! Wash those yummy cookies down with a big Coca Cola, (100 calories), and you have saved 100 calories by not eating that evil avocado- pat yourself on the back. Don’t train intensely, for strength! Muscle weighs much more than fat, and your scale weight will look really bad- so stop doing resistance training! NOW! Eat LOTS of grains and sugars! These two items will pack on the FAT better than anything else.They are low fat, even NO fat for the most part, and so they will spike your insulin after your blood sugar is driven way up high. You will then have your blood sugar drop from the insulin, triggering new appetite for... more carbs and sugar! This will repeat the cycle, over and over... and you will never feel full, because your blood sugar keeps rising and falling! So, there you have it! How to get really fat, and sick, and diabetic, and disease prone. What? You’d rather get lean, fit, and super healthy? Well, there’s no accounting for taste, but that’s easy- just do exactly the opposite of all of that conventional wisdom! Eliminate grains and sugars from your diet as much as possible. Drink a large, green Paleo Smoothie, loaded with every nutrient you can pack into it, every single day. Train intensely, for strength and strength-endurance- do you Perfectly Paleo Exercises daily- visualized resistance, self resisted, pushups, straight legged situps, hindu squats and pushups; bridging. Buy a set of gymnastic rings, and make or buy a kettlebell! Sprint. Pay close attention to food quality, and nutrient density. You are what you eat, and in the case of animals, you are what you eat ate! Eat wild caught seafood, and grass fed animals whenever possible. Pastured dairy products are also immeasurable better for you. Exercise in brief, intense working sets! FEEL your muscles working, and learn to relish the feeling- your body craves such work. Eat LOTS of fat, to get lean! This is key- fat will satisfy your appetite like nothing else, and there is good reason- your body needs good quality, natural God made fats more than any other category of nutrients. Fat is needed to run our brains, and every cell in our body. Fat- it does a body good! And lastly, NEVER count, obsess, or limit your calories as a means to control your body weight or composition. This just teaches your body to panic, and hold onto every bit of fat it can, and store even more, since it thinks you are starving. Eat until satisfied, with plenty of real God made foods, and you won’t be hungry again for a long time. This thing with Resistant Starch just keeps getting bigger and bigger in Paleo Land! So, there you go! Fat or lean, sick or healthy, happy or depressed... it’s your choice!